Another 10 I'm Tossing Post. Wella Shimmer Delight - Shine Spray: I got this so long ago in a Glossy Box. I liked it quite a bit. Would I buy it again? No, I am using the silicone free shine spray from Pantene right now, it cost about $2 and is just as good. Bath and Body Works Creamy Body WAsh in Butterfly Flower: I got this so long ago, back when the outlet first opened and Butterfly Flower was first discontinued. I really love the scent. I also really love butterflies (or papillons). The creamy formula is much nicer in the colder months than the regular clear body wash by them Would I buy it again? Yes, but sadly the scent is no longer around and as for the creamy body wash, I never see it in the stores. Too bad. 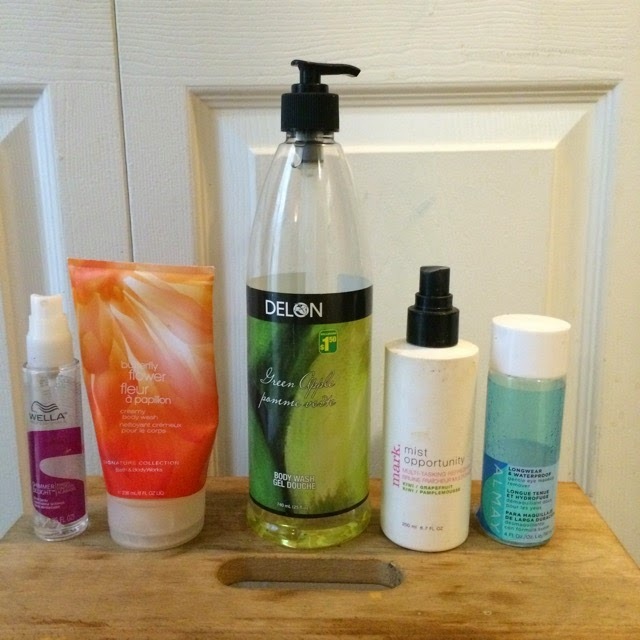 Delon Green Apple Body Wash: I got this to refill my Lysol No-Touch Hand Soap System. I find the Lysol refills a rip off and just wasteful. Instead I usually buy econo refill hand soaps and top it off, but I was in a rush and went to my dollarma. All their hand soaps were made in China, but Delon products are made in Canada, so I opted for this body wash. I like the apple smell and it worked well. I got about 4 refills out of it.Would I buy it again? Yes, I think for the $2 it worked well. I sometimes added a bit of dish soap to it, since it was just body wash and I felt it needed a bit more cleaning ability. Mark. Mist Opportunity: I've had this forever. I like it as a setting spray. Would I buy it again?No, it is discontinued, but I am also glad I've moved on to better things. Almay Longwear and Waterproof Gentle Eyemakeup Remover: I finally used this baby up. I really like how well it works to take all my eye makeup off without pulling or tugging. Would I buy it again? Yes! I love this stuff! Avon Ultra Color Rich White Gold Lipstick in Red Karat: Way back when I sold Avon, my coworker wanted this colour, she didn't like it so I ended up with it. It is a bright red with white gold flecks. It never really worked on me. Would I buy it again? They don't make it anymore, but no. Mark. Earth Perfume: Once again, back when I sold avon/mark I ordered this. While I liked it an used about 60% of it up I just don't wear it any more. It really smells like cucumbers. Would I buy it again? They don't make it any more, but no. 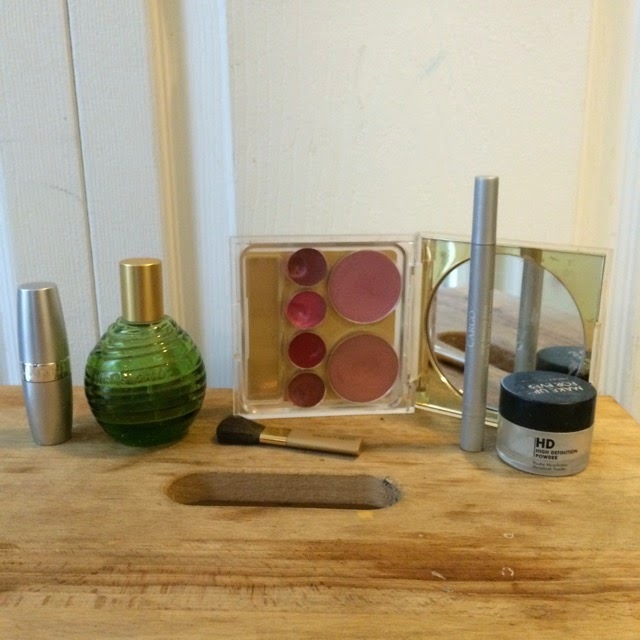 Estee Lauder Cheek and Lip Palette: This one is an oldie. I really don't know how long this has been hanging around in the back of my drawer. I believe I got this about 9 years ago. I used to use the blushes a lot. Would I buy it again? I think every shade is discontinued. I do like the quality of the Estee Lauder blushes and would consider buying them again. There you go 10 more items that are out the door.